High quality, solar reflective, aluminum, thermoplastic coating that will maintain its bright, reflective appearance for many years. SILVER FILM is a single component, liquid applied, bright aluminum solar reflective coating that will maintain its reflective qualities for many years. It is a high solids, thermoplastic resin based product that maintains superior adhesion to most metals as well as asphaltic, or coal tar pitch roofs. 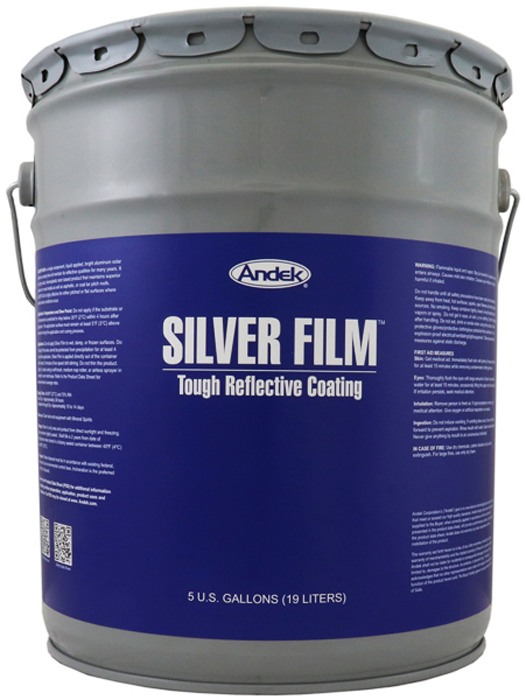 SILVER FILM is highly effective for either pitched or flat surfaces where ponded water conditions occur. SILVER FILM is significantly different to other aluminum colored roof coatings. It contains no asphalt, no fillers and uses high quality automotive grade flake pigment. At 3.5 pounds of aluminum metal flake per gallon it produces a layer of protective metal composite that can provide 7 to 10 years of protection in a single coat. 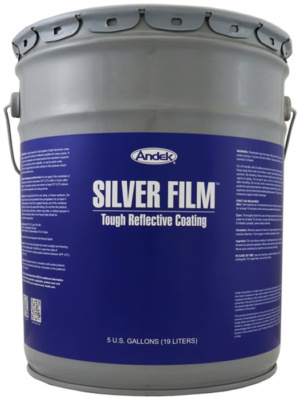 Do not apply Silver Film to wet, damp, or frozen surfaces. Do not apply if the area cannot be protected from precipitation for at least 4 hours after application. Silver Film is applied directly out of the container after at least 2 minutes of low speed drill stirring. Do not thin the product. Apply in 2 coats using a soft brush, medium nap roller, or airless sprayer in a smooth, even technique. At 80°F (27°C) and 70% RH. Store in a dry area and protect from direct sunlight and freezing. Keep container tightly sealed. Shelf life is 2 years from date of manufacture when stored in a factory sealed container between 40ºF (4ºC) and 90ºF (32ºC).